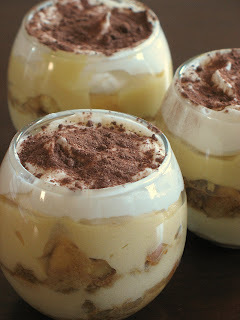 I am having a renewed interest for Italian desserts and a sudden craving for Tiramisu. Since I don't seem to own that many Italian related cookbooks I dug up this recipe online. I think I must have looked at over 100 Tiramisus and as I often say: "my eyes were burning, my gums were hurting and my stomach was grawling from all that sugar"! , but now my taste buds are dancing! Like many among us, I will always remember the first time I had (good) Tiramisu. My parents had taken my brother and I on a little excursion to Italy. We were staying in the Alps so it was a quick hop and we stop in a small village and entered the first restaurant we found open. I believe that I am the only one in the family to remember the whole thing but it was truly my first foodie experience. Everything we were served that afternoon was made fresh by the chef. He was alone in the kitchen, cooking us freah trays of antipasti, freah ravioli, salads and desserts. My father loves Tiramisu and never fails to order one at Italian restaurant he visits,(no joke), so you can bet that he was not going to pass on the opportunity to sample another! I will always remember the look of satisfaction in his eyes after taking the first bite, that nod of his head toward my plate to tell me I could go ahead I would not be disappointed. My excitement was building up, my first grown up dessert! So classic in its black and white attire, so full of promises with its creamy interior. That particular Tiramisu set the standard for my expectations of a good Tiramisu: a subtle balance of espresso, brandy, cheese, cream and cookie. 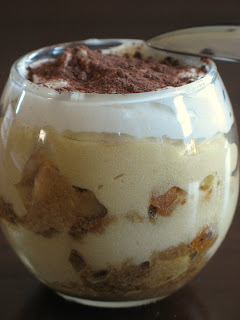 You will find many different ways to make Tiramisu and I have yet to be sure of the "authentic" one. Some conain eggs, some whipped cream, some start with a sabayon/zabaglione, some use thin European ladyfingers, some prefer Savoiardi cookies. One thing for sure: use only the best mascarpone cheese you can find. I really hesitated between Mario and Tyler for this recipe. I tried not to be influenced by the reviewers. I really wanted to make Mario's version, his being if Italian descent and all, but in the end Tyler's won...and no not because he is a cutie (and Lisa won't disagree with me...! ), but because it did not seem as dry. I am sure I'll eventually try Mario's and compare. This one is a kepper, flavorful, creamy, dense, complex. Cream together egg yolks and sugar in a heatproof bowl set over a pot of simmering water. Add 1/3 cup of the brandy and continue to whisk until mixture is thick and doubled in volume. Remove from heat. Stir in the mascarpone until completely blended. In a small saucepan, combine espresso, chocolate, rum, vanilla, and remaining 2 tablespoons brandy. Heat gently, and stir to dissolve the chocolate. Then, chill the mixture to cool it down, about 15 minutes. Divide the broken cookies pieces in the glasses and spoon enough of the coffee mixture to soak them. Spread 1/2 the mascarpone cream evenly with a spatula on top of the cookies. Repeat with a second layer of cookies, more coffee and remaining mascarpone cream. Whip the remaining 1/2 cup of heavy cream to soft peaks. Top each glass with some whiped cream. Sprinkle top with cocoa powder. Refrigerate for 2 hours before serving. I think I could have way too many of these in one sitting. They are delicious! I am 8 again! I hope I have not missed the deadline...I might have by a few hours... I am talking about my first participation in "Hay, Hay, it's Donna Day", a monthly event hosted this time by Running With Tweezers. 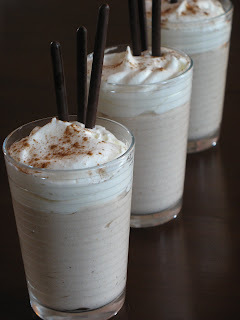 The theme this month gave me the possibility to make one of my to-go desserts when only a few ingredients are on hand and I want to impress guests with a minimum of fuss. Really, once you get over the fear of the whole "Oh My, Souffles...", there is nothing easier to do. If you know how to whip eggs to a stiff foam, then you're set. I like the fact that souffles carry that mystic aura around them but I wish novice cooks were not that afraid about making them. It is truly fun to see a little puddle of egg whites foam up in the oven and then quickly turn its ugly head by deflating on you the moment you start breathing a sigh of relief because you succeeded. Souffles are deceiving like that, yet comforting, like resting your head on a pillow. I love digging my spoon into one, releasing that cloud of aromas and flavors. I love that they feel so light on my tongue with a glass of wine. I love that I feel no guilt if I have one (or 2) for dessert and I love the thousands of possible flavors you can spend a lifetime exploring in just one dessert. 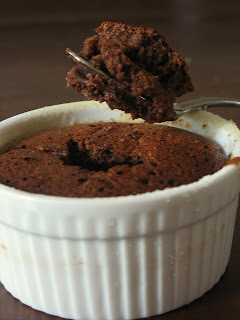 I was pressed for time but did not want to miss the chance of baking one of my favorites, a chocolate Kahlua souffles. Obviously the alcohol can be changed at your heart's content but coffee and chocolate are definetely a good pair. Melt the butter in a saucepan. Remove from the heat and add the flour. Stir until smooth. Place the milk and chocolate pieces in a saucepan and heat until the chocolate melts. Pour onto the butter and flour mixture, return to low heat and stir until the mixture thickens a bit. Remove from the heat. Add the sugar, liqueur and egg yolks, and mix well. Whisk the two egg whites until stiff and gently fold into the chocolate mixture. Turn into 4 greased ramekin dishes. Cover and place in a roasting tin with 1-inch (2.5 cm) water. Bake at 190C/375F/gas mark 5 for 40-50 minutes. Serve immediately. Wait a minute! These don't look souffle-ish...! Well, this is an actual picture of a souffle in the deflating phase...seriously! The reason? Batteries put in the wrong way in the camera and the following 40 seconds delay in the picture shot which gave enough time for that little marvel to show it's ugly side...oh well, it is still delicious. I can never resist a sweet blogging event and when Cheryl of Cupcake Bakeshop and Garrett of Vanilla Garlic announced a Cupcake Round Up event, my mind started salivating....Oh yeah, by now it is not my mouth anymore...! I have had less time these past few days to be as creative as I would like to (more personal training clients, crafts projects to finish up...) but I did not want to miss the opportunity to show up with something of my own at this event. I had half a can of chestnut puree left from the other day so I looked for a recipe that would allow me to include it in the ingredient list without perturbing the other liquid/dry ingredient ratios.I got inspired by this recipe from Magnolia Bakery and the frosting came about according to what I add in the pantry and refrigerator. I love cream cheese frosting, I love chocolate and I love chestnuts. I did not want the frosting to be too sweet so I reduced the amount of powdered sugar one would normally use and used bittersweet chocolate. It was perfect to balance the smoothness of the chestnut. i kept them on the small side as B. is trying to watch his sweets intake and they made a perfect little bite to have with coffee after dinner. Line a 12-cup muffin tin with cupcake papers. Set aside. In a large bowl, on the medium speed of an electric mixer, cream the butter until smooth. Add the sugars and beat until fluffy, about 3 minutes. Add the eggs, one at a time, beating well after each addition. Add the chestnut puree. Mix well. Add the dry ingredients in three parts, alternating with the buttermilk and vanilla. End result? I made them on tuesday and they are already gone...talk about self restriction! Bad me! I told you I had gotten the bug... The second installment of my love for "Verrines" is inspired by this cool little book and my never dying love for blood oranges. When I see them in the store around December-January I tend to buy several bags at a time, that and kumquats...I currently have 8 pounds of the gorgeous beauties sitting on my counter and ideas flying through my mind every minute. We had company for dinner the other night and flipping through the pages of the book I noticed a recipe for an apple crumble in a "verrine". Just the sight of those juicy cooked apples topped with a cinnamon crumble was enough to make my stomach growl. But I was in the middle of juicing blood oranges, not slicing apples. I did not have the desire to crank the oven on either as it was still pretty warm outside. I started this dessert by thinking "well, I'll just make a fruit salad and layer it with Greek yogurt and crushed ginger cookies"...but I was lusting after that picture, those nice juicy fruits....and then the Kitchen Fairy kissed me on the forehead and I started whisking some blood orange curd, caramelizing some kumquats...and oops....there you have it. The blood orange curd is from Sara's Kitchen, and her blood orange sauce. Thank you Sara! Combine sugar, orange zest, orange juice and eggs in a saucepan. Cook on medium heat, whisking constantly, until sugar is dissolved and the mixture thickens. Let cool to room temperature. Preheat oven to 350°.Lightly coat hands with flour. Shape dough into 24 balls (about 2 tablespoons each; dough will be sticky). Roll balls in 1/4 cup sugar. Place balls 2 inches apart on baking sheets coated with cooking spray. Bake at 350° for 15 minutes or until lightly browned. Cool 1 minute on pan. Remove from pan; cool completely on wire racks.Note: These freeze well. Place cooled cookies in a heavy-duty zip-top plastic bag; store in freezer for up to 1 month. Thaw at room temperature. Wash and cut in half a pint of kumquats (except the ones I popped in my mouth while cooking)and put them in a heavy saucepan with 1/3 to 1/2 cup sugar, cook over low heat until the sugar is dissolved and all the kumquats are nicely coated with the syrup. 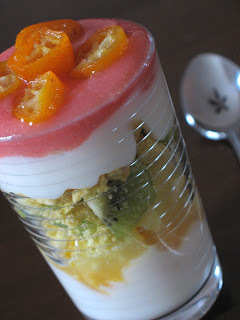 Last step: have fun layering everything in the order you want with some Greek yogurt or fromage blanc or any of your avorite creamy concoctions and top with a layer or blood orange sauce and a few caramelized kumquats. When I read about the chosen theme for this month SHF on David Lebovitz's blog I let out a little sigh...chocolate? again? Unbelievable as it seems, even I, the chocolate lover, was starting to gravitate towards more fruit based desserts after my chocolate filled holidays. But I kept on reading because after all, once you fall for chocolate you just keep on reading and eating and baking,.... The idea for this month was to pick a brand, any brand of chocolate and cook/bake with it. I have to admit that although I do not consider myself a chocolate snob, I tend to buy higher end chocolate bars and blocks rather than store bought for some of my baking. The results are incomparable, and so are the textures and flavors. I have bought evey brands out there I could find in hope that even a cheap bar could taste as good but most of the time I have been disappointed. If I am going to include chocolate in a cake I choose Callebaut or Schockinag. They melt well, the chocolate retains its flavor through high temperature baking and I still have connections to get some big slabs at a moderate price. I use Valhrona if I make ganaches, creams and custards because the flavor really comes through and your palate can really tastes the chocolate. Everybody has a different opinion about what kind and what brand of chocolate tastes better to them. I believe that one has to try as many different kinds of choclate brands and cocoa percentages to know what appeals to them. There is no shame in proclaiming loud and clear your love for a particular kind, whether it be dark, milk or white (not really chocolate I know but good anyhow). I confess that I am a milk chocolate fanatic, and dark chocolate higher than 65% does not appeal to me. For some reason it coats the back of my throat and leaves a very acidic tastes on my tongue. I am always in search a good quality milk chocolate, not one over saturated with cream, but one that is one molecule removed from a very smooth dark chocolate. While at the Grande Epicerie at Le Bon Marche, I was lucky enough to find 2 really interesting (to me) chocolate bars. In my pursuit to like darker chocolate I bought a bar from Michel Chaudun via Weiss chocolatier, 70% dark chocolate with cocoa nibs. The second one was a milk chocolate bar from Michel Cluizel, "1er Cru de Plantation ‘Mangaro’ Milk Chocolate ". I had a nibble of each the other day, and then I stacked one square of each and popped them in my mouth...and then I repeated this last bit by stacking them on top of a shortbread cookie...and then I wished I had a dozen or so of them...! But they were not easy to eat like that, if only I could melt them and serve them in a little shortbread crust... The solution was very easy: a chocolate ganache tart, and because I would melt the milk chocolate with an equal amount of dark chocolate the cream would not overpower the object of my desire. Thank you to the two Michel for allowing me to create what is to me the best chocolate ganache tart I have had so far. 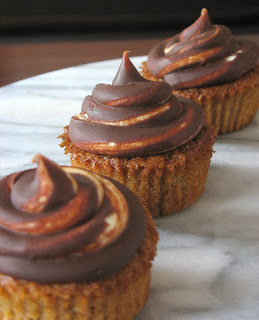 If you want to make this, use what your tastebuds qualify to be the best chocolate. Tastes is as subjective as love so use what you enjoy best. Chocolate Ganache Tart, adapted from my head and Doris Greenspan (crust). In a food processor, pulse all the crust ingredients. Empty in a bowl and knead until the dough comes together. The butter will warm up when in contact with your hands and will allow you to form the dough unto small disks. Wrap in plastic and refrigerate while you prepare the ganache. Heat the cream over medium heat. When hot, remove from the stove and throw in the chocolates, let stand for a minute. Gently stir to incorporate all the chocolate. Let stand at room temperature while you prepare the tartlett crusts. I used 4 inch round tartlet molds but you can use smaller ones if desired, I got 3 filled tart with the quantity of chocolate I had melted. That point is really make and bake as you go. Remove the dough from the fridge and roll out between two sheets of plastic wrap. Fit the dough into the tartket molds, prick with a fork and refrigerate while you heat up the oven to 350 degrees. Pre bake until done. Let the shells cool completely. Remove from the molds and fill with the ganache. Refrigerate until the ganache is completely set. For the decor, I melted 1/2 cup of sugar woth 2 Tb of water until golden brown and spoon shapes and lines onto parchment paper. I let the caramel cooled completely,cut out stands and branches and stuck them in the tart. Ok, this was a rare splurge, combining 2 great names into one little tart, but hey it felt really good and the world around me almost stopped for a few minutes! I love many things in life, and this dessert sprung out of a an old love I have for chestnut puree and a new addiction my awesome aunt Agnes nourished this Christmas by giving me a really cool little book. Everytime I go home, I ask my mom for a few favorites: boudin noir, blanquette de veau, viande des grisons, creme Danette or Mont Blanc, and "creme de marrons". On its own, it is just allright but when used in custards, cakes and mousses its flavor really shines through and the cream takes on a velvety smooth, somewhat chocolatey taste. We did not eat it in great quantity in our house thus it truly felt felt special when I could have some. This Christmas, I dragged B. into the Grande Epicerie at Le Bon Marche where we stocked up on fine chocolate, Mariage Freres tea, jams and syrups and of course a jar of chesnut cream. It had to be kismet or fate because while I was perousing a couple of French magazines on the plane home, looking for ideas for an upcoming dinner party I found a promising recipe for a "bavarois" using the chestnust. The picture looked nice enough, but after reading the above mentionned book I could not stop thinking about using glasses as a plating and serving medium. They turned out perfect. The flavors were great and "grown up", the presentation allowed me to let the kid in me play around a little. "Verrines" are great for layering but the different types of glasses you can use really help support your imagination and creativity. I have to warn you that you might see a lot more of this type of dessert on this blog because I have caught the bug! I have to mention Mercotte for starting this! 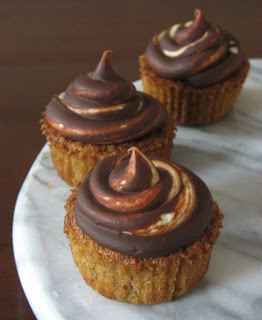 Her blog is full of delectable creations! Serves 6. Prepare it the day before so that it has time to set and allow the flavors to develop. Sprinkle the gelatin over some cold water (I used 1/2 cup). Set aside. Make a creme anglaise: Heat the milk until very hot. In the meantime, whisk the egg yolks and sugar until thick and pale. When the milk is hot, slowly but steadily pour it over the egg yolks and continue to stir until well incorporated. Put the mixture back on the stove over medium low heat and continue to cook and stir until the cream coats the back of a spoon. Remove from the heat and stir in the gelatin and the cognac. Mix well, add the chestnut puree and let cool to room temperature. Whip the heavy cream to a stiff mousse and when the chesnut cream mixture is cool but not yet set, fold the whipped cream carefully. At this point you can line indivual molds with plastic wrap and divide the mixture among them, refrigerate and when the mixture is set, inver the molds and remove the plastic, decorate and serve. I took six small glasses and divide the mouse among those. 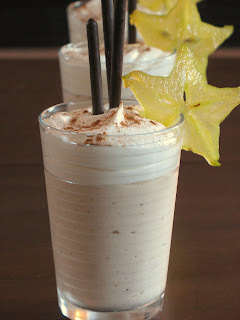 I topped each with slightly sweetened whipped cream, a dash of cinnamon, a couple of chocolate cookie sticks and star fruit. What to do when you just got back from vacation and the only things in the fridge are eggs and milk, and sugar in the pantry? This is what happened to us last week when we got home and my mother in law had nicely provided us with some essentials: eggs, milk and bread. 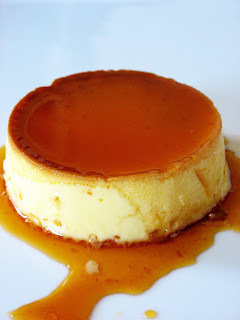 We feasted on an omelette and grilled bread the next morning and after filling up on groceries, my brain was still foggy and jetlagged so I settled for a very simple, but yet very comforting creme caramel for dessert. I can't tell you where the recipe came from as it is the one I used everyday at the restaurant for years and found it in the giant recipe box the various chefs on duty had created decades ago. What I like about it is the way it lends itself to many variations. Extracts, liquors, syrups, fruit purees, nuts and such can be added to the custard base and one can really let his/her imagination run wild. Heat the milk until very hot. In a separate bowl, beat the eggs and sugar until pale and well blended. Slowly pour the milk over the eggs/sugar mixture and whisk until well incorporated. Let cool to room temperature and pass through a sieve or colander. 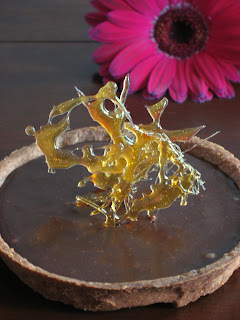 In a heavy saucepan, melt the sugar with the lemon juice until you reach a nice deep golden color. Be careful as the caramel will continue to darken once removed from the heat and you ccan end up with a very bitter and very dark caramel. Carefully divide it among 4 ramequins. Let the caramel cool and harden for a few minutes. In the meantime, prepare your water bath: in a deep baking pan, pour some hot water to about an inch deep and set your oven to 350 degrees. Pour the egg custard mixture on top of the caramel and set your ramequins into the baking pan. Add more water if necessary, the water bath should come to about half way up the sides of the dishes. Bake for about 20-30 minutes or until the middle still giggles a bit when shaken as the mixture will ontinue to cook and set when refrigerate. Let the water bath cool off for a few minutes and remove the ramequins. Let them cool off to room temperature. Refrigerate a couple of hours before serving. To serve, run a knife along the side of the ramequins, invert them on the plates and giggles them a bit to help the custard fall down. Decorate to your own taste and enjoy! 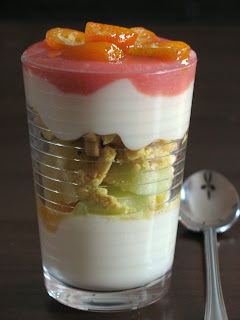 This is one of my to go desserts, complementing a heavy dinner but a light note, crisp in flavor yet so simple. Just like with creme brulee or cheesecakes, the flavors can be changed at will. 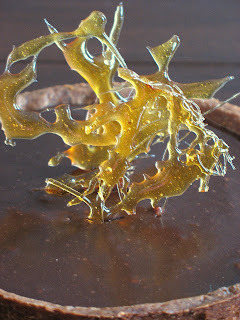 I like infusing the milk with bergamot or Earl Grey tea leaves, lavender buds, citrus and fruit peels during the summer. Pumpkin is great added to the base during fall, and I sometimes replace the whole milk with soy or coconut milks for a different flavor during the winter. Our 4 day trip to Paris was indeed filled with sugar and chocolate treats but I did make it to 2 of my "must see" "boulangeries"...my list was close to 5 pages long so I went for efficiency (it was cold) and locations (did I mention it was cold?). I took B. for quite a hike looking for 140 Boulangerie as we got of the subway 2 stops too early and walked the rue de Belleville all the way up to the pastry shop. It helped us locate a great little Thai restaurant for lunch and kept us kind of warm while getting there. I stood in front of the shop's array of bread (not me in the picture) for ages trying to decide what to get and finally decided on an almond croissant. The hike had burnt a whole in my stomach and I figured we could have the rest of it for an afternoon snack. 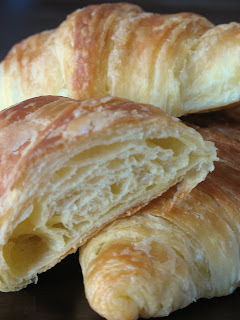 It was hands down the best almond croissant I have ever had in my life (and believe me I have had my share). 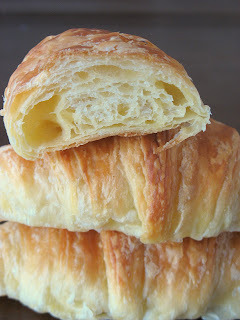 The dough was flaky and buttery in every bite, the filling was plenty enough to fill every mouthful with a smooth almond taste and the best part was how it had caramelized at the bottom of the croissant adding a bit of a crunch which I always favor. I have to admit that I don't recall B. having much of it...bad me...! The other boulangerie I absolutely could not miss was that of Eric Kayser where I knew exactly what to purchase: a baguette Monge which I had tried to recreate a while back and still make once in a while but never mine tasted as good as this one! 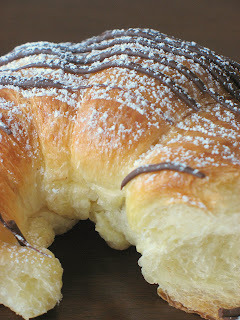 (duh) This time I did not forget my sweet-seaking companion and got a couple of chocolate chip brioches for breakfast. Funny how no crumbs could be found anywhere.....! You know how much I enjoy making macarons but the truth is is that I don't eat that many. I enjoy one bite and then I am done. I still wanted to see, touch and try plenty of them and did so by purchasing a sampler in 3 different places. Unfortunately I only got pictures of one set, so you will just have to rely on websites and my descriptions for the others. I realised one morning walking to the subway station that one of the shops on my list was staring at me while I was looking up at the sky. After 3 days of this, B. commented that it was interesting how my obsessions would materialize "on the way to..." well, what can I say, Paris is not that big after all and if you lift your nose you find out plenty of cool little places. What happiness to stumble upon "Cacao et Chocolate" like we did! We purchased a dozen of "classic" chocolates (by the form, although there was nothing classic in the taste) and a box of Szechuan Pepper ones which turned out to be a innovative and tasty creation. I also added a sampler bag of macarons to my order and off we went to the next sweet stop. We shared a few and found them well executed and tasty but nothing to make me go "these are the best". I believe the shop is great for its interesting choice of ganache but there were 2 masters I really wanted to visit. We stop by Pierre Marcolini store (0nce again conveniently located on the way to somewhere...), where I purchased a chocolate Christmas tree. We did not have a "need" for it, (absurd word when it comes to chocolate), but figured we could give it as a hostess gift somewhere long our travel.... it is funny how quickly we came up with the fact that nobody would really enjoy this masterpiece and so we found a little bench and opened up the box as if a treasure was inside...and gold we hit indeed! I don't recall ever tasting something as fine and smooth as this. We had made reservations that evening at L'Ami Jean which held the promise of great Basque food and unforgettable atmosphere and service. Dang! How do we do this, Michel Chaudun's shop was on the way! I am telling you the sweets Gods were on our side, not the fitness ones.... and at that point we had blown every bit of reason to the wind! Unfortunately we arrived a few minutes after closing time and were left to admire the window display..if his chocolates taste as good as they taste you are in for an adventure! Well, now we have a reason for another trip! Dinner at L'Ami Jean was truly spetacular. The restaurant is small but the plates are giant and the portions just as big. We dinned on a true basque veal Axoa, foie gras and desserts were a basque yogurt topped with pistachios and sour cherries. B. even had his first taste of absinthe and we elbowed with a couple of French celebrities. I had built up a year's long worth of expectations about Sadaharu Aoiki and this trip filled every one of them. Everything about the pastries swept me away: their design, their flavors, their presentation and their taste. I had never felt that torn looking at a pastry case...how many can I purchase and eat given that the holes left on my belt were disappearing day after day....how many more days here do we have left? how many miles can I walk to work them off? maybe of I skip breakfast, and have a light lunch...Oh forget it! Live large (and get large) for a while, it's not everyday I get to do this! After much discussion with the little voices in my head...(B. at that point was feeling like I was: up for everything! ), we decided upon a sampler of macarons, a chocolate chip kugelhopf, mini matcha tea financiers (which I love), and the "piece de resistance" a Yuzu tart. We had the financiers with coffee one day, the kugloff for breakfast, the tart for dessert one night and we nibbled on the macarons while queuing at the Opera....Life is good!! It was difficult to pick the tart among the array of amazing looking pastries but we did not regret our choice. Smooth like a mango and tart like a lemon, the curd was set on a perfectly sandy shorbread base and was the perfect end to a dinner in Montmartre. To be fair, we purchased another dozen macarons from Gerard Mulot, as we figured one could not judge on two shops only....I have to say his creations were pretty great: pear-ginger, basil-lemon, nougat, coconut, salted caramel, violet...but this trip Aoiki won our vote. I could not leave you without a few pictures of my dream kitchen: the one in the castle of Chenonceau which we visited after New Year's Eve on our way back from Tours. You probably have wondered where I have been hiding since we came back last week. Truth is, I have started this post a million times and erased it just as many. 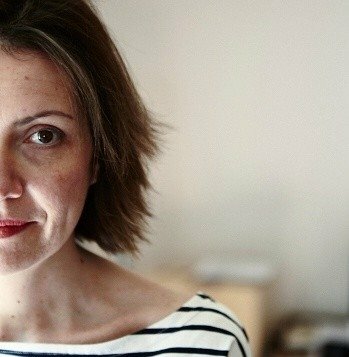 I never thought it would be so difficult to jump back into blogging after three weeks off. Between bad internet connections and entertaining friends and family since our coming back, it has been difficult to sit and write for more than a couple of minutes at times. I have to apologize for the poor quality of the pictures accompanying this post, but most shots were done on the spot, either in a hotel room (sometimes bathroom) or on the dining room table. No time to stage and plan! We have had the most wonderful time in France. It was a true blessing to see as much of my family as we did. Every minute of every day was filled with things to do, people to see and places to visit. We were lucky to be staying with my parents in Le Mesnil Saint Denis, not far from Versailles and being so close to the things we had planned to visit. We started by an amazing show in Paris, Le Quatuor, where both B. and I laughed our heart out. The next day, we were leaving for Normandy where we saw the Mont Saint Michel, the beaches of D-Day, the American cemetery, the Bayeux Tapestry, the Memorial of Caen, and dined on fine foods and wine. We returned home to prepare Christmas and welcome my brother and his family. Words fall short to express the joy it was to see my nieces Lea (6 years old) and Camille (4 months). Each day was filled with laughs, games and pranks! Food wise, I have to say "hats off" to my mom who had prepared great food ahead of time and who nicely gave her kitchen to her son for the main course of Christmas dinner, a capon with a white boudin and truffled stuffing, and her daughter for dessert, a traditional praline filled Yule Log and a Nougat & Rapberry ice cream one (sorry no pic of that one). Being the good sister than I am , I made sure he had a bowl of his favorite treats, "chouquettes"
while I snacked on the biggest meringue I had ever had from the patisserie next to our house. Right after Christmas, B. and I eloped to Paris for a 8 years- late honeymoon during 4 days. We did not rest much during this time as we had paln to alternate visits of museums and pastry shops in a mini 4 day marathon, an Amazing Race of food and knowledge if you will. We stayed in Saint Germain des Pres in a quaint little hotel and made "Neo Cafe" our after dinner, late night spot. Our heads are filled with sculptures from Rodin, relics and gold from Cluny, found treasures from Alexandria at the Grand Palais, Mozart at the Opera. I admit we gave up waiting in line for the Doisneau exhibition at the Hotel de Ville when we were told the wait was 2 hours...outside...and it was freezing cold! I had told B. about all the pastry and chocolate shops I wanted to see but I did not want to make these 4 days just about what I wanted. I knew there were museums and places he wanted to see no matter how much he also likes macarons! However I did not expect him to get caught in the game of finding these places and some were wuite out of the way! It had been 10 years since my last stay in Paris and I found myself looking at maps and bus stops just like any tourist! Except for the language, everything was just as different to me. It was virtually impossible to do everything on my list in 4 days (including travelling times) so we went for what was close to us and the museums, parks and neighborhood we had planned on seeing. Literally across from our hotel was Gerard Mulot Patisserie where we filled up on pastries for breakfast, and bought desserts and macarons for my parents...well, I needed an excuse to sample more so we said we would bring desserts back! In the background from left to right: "chausson aux pommes" (apples in puff pastry) and classic Financier. In the foreground: cannele, a specialty from Bordeaux, and "cerisai" which is to this day one of the best thing we both ever tested: a ligth cake filled with pistachio cream and sour cherries. Not bad to start the day! Or this delicious Delice de Ninon aux Peches: a thin genoise layer filled with a light peach cream with diced caramelized peaches. We are back in the States. Got here late last night and although I wish I could jump right in and pick up where I left off I am allowing myself the weekend to recuperate and get our things in order....pictures, books, chocolates and memories....!